Smother Goose: "The Velveteen Rabbit"
When this book was read to me, I had no idea what velveteen meant, but I figured it was like "Florentine" or "Argentine" and denoted that the rabbit was from Velveeta. I realize now this is not the case. Although the boy of the story is initially overjoyed to find the velveteen rabbit in his stocking, soon reality hits: "For at least two hours the boy loved him, and then Aunts and Uncles came to dinner, and there was a great rustling of tissue paper and unwrapping of parcels, and in the excitement of looking at all the new presents the Velveteen Rabbit was forgotten. For a long time he lived in the toy cupboard or on the nursery floor, and no one thought very much about him." All of the toys snub the velveteen rabbit (shades of the toy racism found later in The Christmas Toy) except the skin horse, who is the oldest toy in the nursery and claims to know all about how toys become Real, since he considers himself Real. He sagely asserts that "When a child loves you for a long, long time, not just to play with, but REALLY loves you, then you become Real." The skin horse admits that becoming real hurts because "most of your hair has been loved off, and your eyes drop out and you get loose in the joints and very shabby." Horrors! Then the boy decides he loves the rabbit, takes it everywhere with him, and when he says that the rabbit is Real, the rabbit believes him. All this changes when the velveteen rabbit meets some really real rabbits outside, and they tell him he can't be real because he doesn't smell right, can't hop, and besides, he doesn't even have any back legs! The velveteeen rabbit is devastated. Things become even bleaker when the boy becomes very ill, and, because the doctor sees the rabbit as "a mass of scarlet fever germs," he is put in a sack with the boy's old picture-books to be thrown on a bonfire. The rabbit crawls out, cries a tear, and from that tear the Nursery Magic Fairy appears and says that when toys "are old and worn out and the children don't need them any more, then I come and take them away with me and turn them into Real." Then what about the skin horse? This story really warped my view of illness because "scarlet fever" had no meaning for me, and I thought any fever meant I'd have to throw all my books and toys into a bonfire. This was a particularly horrifying prospect considering that at any time, the toys could become alive! I did not want my stuffed sheepdog to be the next Joan of Arc, so I tried to stay as healthy as possible at all times. If my bedsheets were changed out after a night sweat or my toothbrush was tossed after a nasty cold, I would grow very suspicious, keeping my germs close but my stuffed animals closer. When toys get old and you don't see them around the house anymore, they've become Real. And when Rover gets old and you don't see him around the house anymore, he's gone away to live on a nice farm. 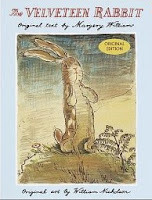 The Velveteen Rabbit. Williams, Margery. New York: Avon, 1922.